Coughing, breathing difficulties, and strong mucous production in the lungs are typical symptoms of COPD. The disease is often triggered by smoking, and, according to estimates from the World Health Organization (WHO), it could become the world’s third most common cause of death in 2030. “COPD has various subtypes that, for example, can be verified by use of quantitative computer tomography (qCT),” explains PD Dr. Wolfgang zu Castell, head of the Research Unit Scientific Computing (ASC) at the Helmholtz Zentrum München. “We wanted to investigate if the microbiome in the lungs changes in a way that depends on these subtypes,” adds Prof. Dr. Michael Schloter, head of the Research Unit for Comparative Microbiome Analyses (COMI) at the Helmholtz Zentrum München. For this purpose, scientists from the two research units examined samples gathered from nine healthy individuals and 16 COPD patients. They were all participants of a Europe-wide population study (EvA Consortium; Emphysema versus Airways Disease). 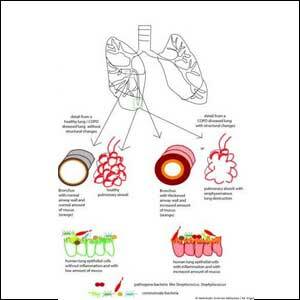 On the one hand, CT scans were used to analyze the lungs and assign the patients to the respective COPD subtypes. On the other hand, the scientists used brush samples from lungs to determine the composition of the lung microbiome using certain marker genes. According to the study, Streptococci are often found in structurally altered lungs. This genus includes many pathogenic representatives that are also often detected in the presence of exacerbations. In the lungs of healthy subjects, on the other hand, there was an increased presence of the genus Prevotella, to which a number of probiotic characteristics have also been attributed.